TEAM Busovne with Keller Williams Realty Emerald Coast is “Your Real Estate Connection”. Janice Busovne has helped countless people along the Emerald Coast with their real estate buying and selling needs. Janice has sold more waterfront properties since 1997 in the Niceville/Valparaiso area than any other realtor (ECAR MLS statistics). With a caring approach and ability to connect with people from all walks of life – from military families to local residents to seasonal beachgoers – she tailors her service to meet the specific needs of her clients. Paige Nunn is Janice’s Executive Assistant. Paige has over 35 years of sales experience having worked in office product sales, automotive sales & management, and real estate. Paige spent 10 years as a Realtor on the Emerald Coast. Paige is gifted in administrative ability and is a welcome addition to our Team. Bernie Busovne is Janice’s Marketing and Operations Assistant. Bernie has over 16 years of experience in industry (automotive, aerospace, and defense) in program management, product development, and production and quality management. He also has been a business consultant for the past 20 years. 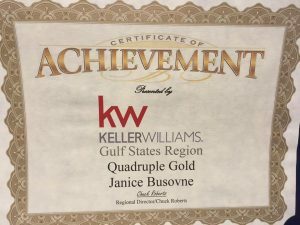 Bernie’s duties include management of Janice’s real estate supplies, marketing, business plan implementation, and management of the Keller Williams’ Niceville office. Julia Williams is Janice’s Webmaster and Social Media Consultant. Julia has over 4 years of webmaster experience and over 10 years of experience working with social media. Julia’s duties include up-dating Janice’s website – www.NicevilleHomeConnection.com – and the incorporation of information and ads on social media. Haley Upshaw is Janice’s social media (Facebook) consultant. She has over 10 years of experience.